Kim Kardashian is unsurprisingly causing controversy again. This time, some are accusing her of cultural appropriation, with others simply calling her out for being a hypocrite. It all started when the 38-year-old mom-of-three showed off her new matching hairstyle with daughter North on social media. In the clips, Kim and North have their baby hair, otherwise known as "edges," gelled down on the sides of their faces, a hairstyle which is attributed with the black community. "Alright guys, look at these edges," KKW says in one video. Although five-year-old North is half black, many attacked Kim online for also styling her hair the same way. North and her beautiful makeup ? Expectedly, tons called out Kim for appropriating black culture. "Why is @KimKardashian so simple minded? KIM you did that baby’s edges backwards," one tweeted. "ALSO, you don’t have edges. ::whispers:: you know you’re not black right?!" 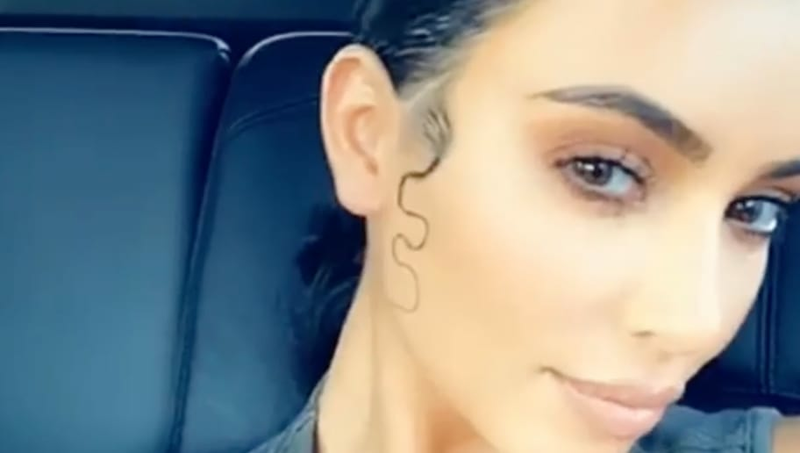 Another wrote on Twitter, "@KimKardashian out here trying to steal another trend with the baby hair slicked down curls black girls BEEN doing this & BETTER ." But the funniest part of all is that a few pointed out how Kim actually got her baby hair removed years ago. As many fans of the family know, the sisters are obsessed with laser-hair removal, which is exactly how Mrs. West got rid of the natural hair around her face. And in 2016, Kim revealed she regretted the removal. "I lasered my baby hairs off years ago, because my forehead had all these little baby hairs, and I would always break out because of them," she wrote on her app. "I also lasered my neck because I had such a hairy neck. Every photographer would photoshop them out anyway, and I thought I looked better without the baby hairs, but now I miss them. I think they look youthful! So ladies, you can always laser your hairline, but I miss mine." While many are upset with Kim for this choice, it's important to note she's explained in the past that North has asked her to do matching hairstyles before. Plus, she already explicitly stated she misses her baby hair. So at the end of the day, we don't think Kim had any ill intent here. She should just be a bit more aware.